James Nielsen holds school records at UC San Diego in the 5,000- and 10,000-meter runs, but no race has gotten more attention than his solo effort Sunday in San Francisco. Likening himself to Roger Bannister and history’s first sub-4-minute miler, Nielsen downed four beers before four laps of the track to set a world record in the beer mile — the first under 5 minutes. Timed by his wife, former UCSD track star Mimi Hodgins, Nielsen was clocked in 4 minutes, 57 seconds — 4:21 of which was running the mile and the rest stopping to empty cans of Budweisers. Nielsen’s 9-minute video had close to 690,000 views Wednesday. His feat was feted on Huffington Post, the Boston Globe website, Bleacher Report and USA Today among many others. A resident of Marin County with his wife and two children, the 34-year-old Nielsen said he had been training for the beer mile record for a year. He said he studied anatomy and practiced quaffing a can of beer — sometimes as fast as 4 seconds. His academic credits are impressive as well. Nielsen was named the 2000-2001 California Collegiate Athletic Association Male Scholar-Athlete of the Year after a career that included three All-America selections, three academic All-America Awards and two NCAA Division III Championships in track and field. Nielsen had a 3.86 grade-point average as an electrical engineering major, according to The Guardian student newspaper. “As a sophomore, Nielsen began working with a prominent person in that field and contributed to his projects. In his senior season, he was a Rhodes Scholar District VIII finalist. He also received the Vice-Chancellor’s Scholar-Athlete Award that year,” the paper said. In his junior season, Nielsen repeated as CCAA cross-country champion and as NCAA Division III 5,000-meter track champion. Nielsen was reported to have entered the doctorate program at Stanford University. His best times at UCSD were 3:50.3 for 1500 meters (about 4:08 for the mile, 14:21.15 for 5K and 29:52.97 for 10K. In a Flotrack.org report, Nielsen is congratulated by two-time Olympian Nick Symmonds — who himself had hopes of being the first sub-5 beer miler. The beer mile requires a runner to drink a can of beer every lap on a 400-meter track for a mile. The beer must be 5.0 or higher in alcohol concentration and consumed from a 12-ounce can that has not been altered. Nielsen’s fastest chug took 7 seconds. The others took 8, 12 and 9 seconds. He smashed the listed world record of 5:04.9 by Australia’s Josh “Harry” Harris last year in Melbourne. In 2012 Harris ran 4:58 while drinking four cups of chocolate milk. 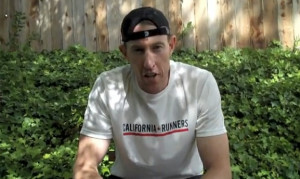 Nielsen, whose nickname is “The Beast,” is a founder of California Runners. “Born and raised in the Bay Area, James started running in seventh grade when two of his teachers started a middle school cross country team,” his bio says.